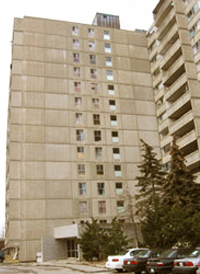 The City’s Licensing Committee will be discussing the City of Toronto MRAB (Multi-Residential Apartment Buildings) program at its meeting on Friday November 16th, 2012. This meeting is an opportunity for tenants and tenant groups to participate in the discussion about the effectiveness of the property standards by-law and whether or not the by-law is properly enforced. Tenants need know whether the current system works and if it has been meeting the regulations of the property standards by-law. Outstanding repairs and maintenance issues have a negative impact on the quality of life of tenants and also violate the property standards by-law. Is the property standards by-law being enforced in a way that ensures ‘proper repairs and maintenance’ in their buildings? How is the MRAB program being monitored? Have there been changes to the MRAB program and have these changes been made public? Tenants need to know whether or not this MRAB program is working well and if property standards are being enforced. Tenants can participate in the discussion to take place on Friday November 16th, 2012. NOTE – In an earlier post “MLS AUDITING PROGRAM FOR 2011 – Update” we raised a number of concerns related to how MRAB conducted audits. Refer to this link: https://eastyorktenantsgroup.com/2011/04/04/upcoming-federal-election-2011/. WITHHOLDING RENT . . . SMOKE FREE HOUSING . . .